There’s no such thing as a lone Ranger these days; there’s one around almost every street corner. So much so that the Ford is the second most popular utility vehicle Down Under. super- and double-cab body styles, Ranger brings the flexibility and toughness of Ranger’s ladder-frame chassis and Australian-led engineering and design in both 4×2 and 4×4 powertrains. Specification levels are XL, XLS, XLT and Wildtrak. Interestingly, XL 4×2 versions also include a Hi-Rider model, which refers to the ground clearance equivalent to the 4×4 Ranger Pick-Ups. Leading the MY19 upgrades across the range is Ford’s new five-year unlimited kilometre warranty, while upper-level variants enjoy autonomous emergency braking with vehicle and pedestrian detection standard on Wildtrak and available as an option on XLT Pick-Ups as part of a driver assistance suite. 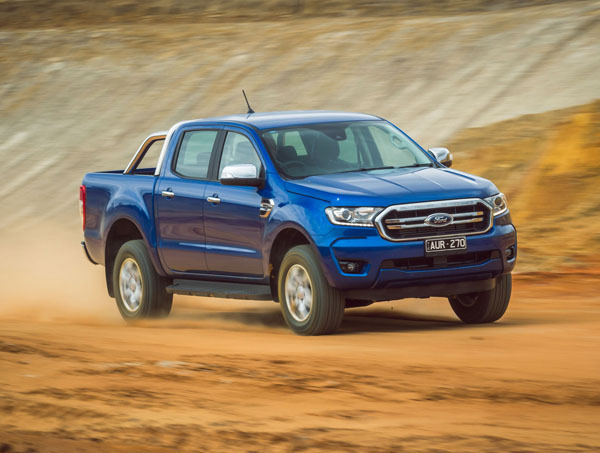 Ranger prices start at $27,990, plus on-road costs, for the XL Single Cab/Chassis 2.2-litre Low-Rider diesel manual 4×2 and top off at $63,990 for the Wildtrak Double Cab Pick-Up 2-litre Bi-Turbo automatic 4×4. The test vehicle was a mid-spec Ranger XL Hi-Rider 2.2L Double Cab Pick-Up 4×2 automatic, selling for $39,690, plus on-roads. Why Hi-Rider? This refers to the ground clearance of 232 mm, equivalent to the 4×4 Ranger Pick-Ups, locking rear differential, and with similar rugged looks. The Ranger XL gets off to a bold start: there’s a Gorilla radiator grille – big and brawny – with the ‘Ford’ blue oval stamped on its forehead, which exudes power and street presence. The tub carries inner tie-downs but lacks a factory-fitted lining, something that is becoming common in these vehicles. The Hi-Rider rolls on 16-inch no-nonsense steel wheels. Restyled ebony cabin treatment has new decorative trappings. Bucket seats up front include six-way driver’s seat adjustment with lumbar support. ‘Clean and forget’ vinyl floor coverings make for low-stress care. The Sync audio features a 4.2-inch colour multi-function display and rear-view camera, AM / FM stereo, MP3 compatible CD player and Aux / USB / iPod integration. Bluetooth includes voice control. The Ranger XL Hi-Rider id powered by a 2.2-litre turbocharged diesel engine putting out 118 kW of power at 3200 rpm and 385 Nm of torque between a low 1600 and 2500 revs. Mated with a six-speed automatic transmission, carbon dioxide emissions are at Euro 5 levels and towing capacity is put at 3500 kg by the maker. A comprehensive Dynamic Stability Control System incorporates trailer sway control, hill start assist, hill descent control on XL 4×4, load adaptive control and roll-over mitigation. Full-colour rear-view camera with guidelines is standard on Pick-Up only and rear parking sensors are new to XL Pick-Up. Ask any automotive engineer and they will say weight is the enemy of any vehicle. This plays out, especially with trades utilities, where running costs are paramount. Hence, often the choice of two-wheel drive over four-wheel drive, where bitumen and the odd dirt road are the domain of most tradies. Serious off-roading is not part of the job description. 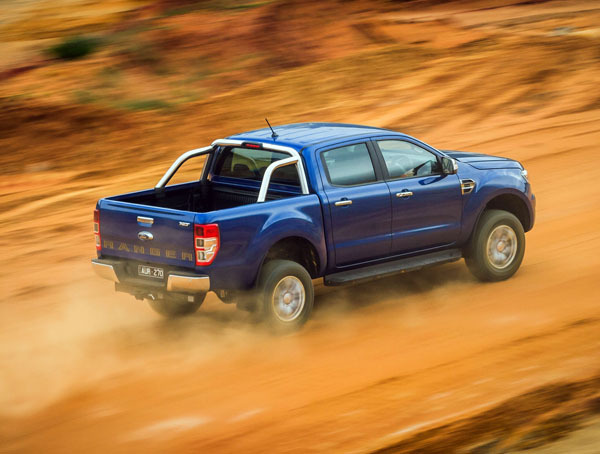 This was one of the main considerations when driving the test vehicle, a Ford Ranger XL Hi-Rider 2.2 turbo-diesel Double Cab Pick-Up automatic 4×2. Two-wheel drive means less heavy machinery to be lugged around. along with little trouble, even with a hillock of garden waste in the tub. Not so impressive was the tendency to hop about on the road with the tray free of load, despite suspension upgrades aimed at improving performance when fully laden or towing. The locking rear diff is a bonus for that bit extra in tougher going. Ford claims a combined urban / highway fuel consumption figure of 7.8 litres per 100 kilometres for the 2.2-litre turbo-diesel. Test Hi-Rider returned figures of 13 litres per 100 kilometres around town and 6.8 on the motorway. Cruise Control is close at hand with steering-wheel mounted controls, as is the adjustable speed limiter. Rear seat padding is firm but not uncomfortable and there’s ample leg room for an average-size adult. The seatback folds to reveal a resting place for the jack. The load has been lightened when accessing the tub, with a new internal mechanism making the XL’s tailgate easier to lift – a 70 per cent reduction in initial force required to close it. It’s easier to lower too. The Ford Ranger XL Hi-Rider 4×2 presents an economical alternative for those not looking for an out-and-out off-road Pick-Up.